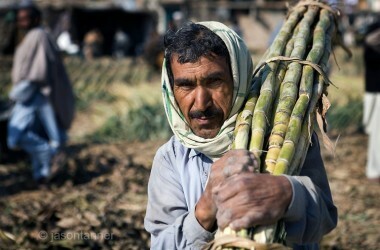 AVERAGE production of sugar cane in Pakistan is 22,000 kg per acre which is below the potential. Agronomic factors like preparatory tillage, bed preparation, planting techniques and time, water availability for irrigation, application of fertilisers, management of ratoon crop, harvesting time, type of cultivars and plant protection measures significantly affect its production. These factors also contribute to the cost of production. It is noteworthy that cultivation of sugar cane crop is carried out for crushing purpose to obtain sugar, gur and other products. By-products like alcohol used in pharmaceutical industry, ethanol used as a fuel, bagasse used for paper-making and chipboard manufacturing and press mud used as a rich source of organic matter that adds to soil fertility are derived after cane is crushed. 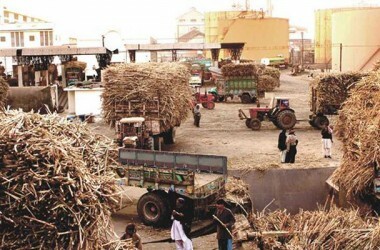 Fixing cane price remains a matter of great concern for the government because to encourage farmers to cultivate sugar cane essential for steady supply to mills, growers should receive judicious price for their produce. It should be borne in mind that fixing cane price is a provincial subject and the provinces have been fixing price in the past and their recommendations are taken as mandatory. The provincial cost of production committee has recommended 21 per cent raise in price and recommended a price of Rs76 per 40kg for the next season against this year’s price Rs60kg. The committee’s recommendations came after careful calculations of step-wise cost of production. Preparatory illage: Preparatory tillage includes initial ploughing with a tractor-mounted mould board plough which is considered essential and should be done extensively. Use of a sub-soiler after every 4-5 years improves soil considerably by breaking the hardpan. This cost is on increase depending upon number of ploughings employed. The committee has calculated preparatory tillage cost of Rs1700 per acre. Last year’s cost was Rs1470. There is an increase of 15.6 per cent. Increase in cost of preparatory tillage can be attributed to inflationary trend in the prices of implements and machines. Other factors that may affect number of ploughings and hence cost include type of previous crop whether deep or shallow rooted. More ploughings are needed to uproot and crush the roots of deep rooted crops like cotton. Seed bed preparation: Since sugar cane is a deep-rooted crop, it requires a well-worked and fully pulverised seed bed. Fine seed bed can be prepared by ploughing with a furrow-turning plough to a depth of about 20-25 cm particularly when soil is clayey. Six to eight subsequent ploughings followed by planking are enough to achieve a good pulverised seedbed free of clods and weeds. Therefore, use of seedbed preparatory implements is extensive. This raises cost of seedbed preparation compared to other crops. Its price as per the committee is Rs690, against last year’s Rs600– an increase of 15 per cent. Sowing: There are two planting seasons– fall and spring. Plating is one both on dry and wet seed bed depending upon the soil condition, water availability, planting time, etc. Double-cut sets are placed end to end in furrows at a depth of 8-12 cm and covered with 5-6 cm soil. In the dry method, immediate irrigation is essential, with subsequent irrigations at short intervals. Planting is done manually that involves labour. It also adds to cost of production. In other cane-growing countries, planting is carried out mechanically. Seed rate: Optimum plant population depends on appropriate seed rate and spacing but the growers often ignored them, which is the key factor in lowering production. The seed rate and spacing between rows differ with variety. Eight to nine tones of stripped cane per hectare for thick varieties, and six to seven tones for medium to thin varieties is sufficient to produce a desired plant population of about 0.15 million canes/ha. Since growers use local seed of previous crop, it does not add to cost of production. But when seed of new cultivar is sown, cost of production increases. Moreover, inter-cultural practices and earthing up also raises cost of growing sugar cane. Irrigation: Sugar cane is a perennial crop and water requirements on an average varies from 120-160 centimeters for the spring crop and 200-250 centimeters for the autumn crop depending upon season, the fertility of soil, and the variety of cane. Autumn planting requires a higher quantity of water than spring planting. During the dry period, sufficient water should be applied at relatively short intervals to avoid moisture stress. Toward the end of the growing season, the length of the intervals should be increased, with irrigation ceasing 25-30 days before harvest to induce normal maturity. Total expenses on irrigation are, therefore, highest. Compared to last year’s expenditures incurred on irrigation at Rs2860, according to the committee, there is about 20 per cent increase in cost of irrigation. Total cost on irrigation worked out to be Rs3425 for the next season. Considerable increase in the cost of irrigation can be attributed to ever-increasing prices of diesel used to operate tube wells. Fertilisers: Soil fertility and productivity significantly affect cane production. It is noteworthy that the nutrient requirements of sugar cane, especially NPK, are higher than those of any other commercial crop because of its high dry matter production per unit area. Moreover, it is an exhaustive crops like wheat, rice, maize etc. that uptake huge amount of nutrients. It requires macro as well as micro nutrients. Each fertiliser element plays its role in the development and production of a normal cane crop. Nitrogen is essential for plant growth; phosphorus for developing roots, influencing the ripening process and purifying the juice; potassium for promoting cell activity/growth, increasing resistance to infection and lodging, and improving sucrose content. For the next season cost of fertilisers for growing one acre sugar cane comes to Rs3675 whereas in the last year’s it was Rs3965 per acre. There is a reduction of around seven per cent which is attributed to subsidy on fertilisers.